I heard about a guy who is a musician by passion and a music teacher by trade. One day I was sitting in his foyer when a student came in for lessons. Minutes later, I heard a few notes of melody followed by a horrific noise. A few more notes and another horrific noise. I got up to peek around the corner and see what was going on. Sure enough, every time the student struck a wrong note, my musician friend would imitate the sound of a buzzer. BZZZZ! Wrong! BZZZZ! Wrong! BZZZZ! Wrong! Living the law is like living beneath a buzzer all the time. All those rules. All the effort. All the paranoia. And before we know it, we’re not even ourselves anymore. But inside we know better, don’t we? The rules criticize us daily and we know we’re failing. Please, let this truth soak into your dry and weary soul today: You are accepted – failures and all – through Jesus. May that nagging failure always drive you toward grace. Lord, thank You, thank You that I no longer try to earn my keep in eternity. I don’t need to hide my inadequacies. I want to give what I’ve been given. Lord, show me where I’m guilty of nagging – of being that buzzer in the lives of others. Teach me to speak the life that comes from Your free grace. Amen. 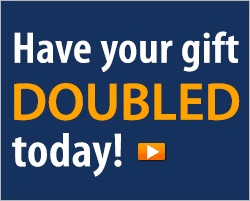 Have your gift DOUBLED today! A group of generous friends has stepped forward with a $35,000 Matching Grant – which will DOUBLE any gift you give today! As a thank you for your gift, we’ll send you Stuart Briscoe’s new 3-message teaching series, Finding Healing, to help you experience God’s healing power in your life.